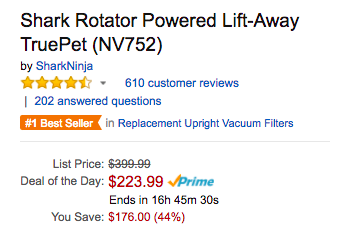 Today only, as a part of its Gold Box Deals of the Day, Amazon offers the Shark Rotator Power Lift-Away TruePet Vacuum for $223.99 shipped. That’s down from its original MSRP of $400 and the regular going rate of $350 at most online retailers. This offer is an Amazon all-time low. It is rated 4.6/5 stars by over 600 reviewers. Shark’s original, full-sized 3-in-1 Powered Lift-Away upright vacuum with detachable canister and convenient caddy for portable cleaning. With the touch of a button, Powered Lift-Away technology allows you to lift the canister away and deep clean hard-to-reach areas while still delivering power to keep the brushroll spinning. Armed with Advanced Swivel Steering and powerful LED lights on the hand vac and nozzle, this vacuum has a completely sealed system with a HEPA filter to trap dust and allergens. The Fingertip Controls allow for easy powering on/off and quick transition between hard floor and carpet mode. The Dust-Away hard floor attachment is perfect for picking up debris of all sizes and dusting your bare floors, while the TruePet Motorized Brush gives you deep cleaning power in the palm of your hand.